Cass County husband Wilbur Lee Meyer and wife Peggy discovered a box of old letters in their attic—letters from the American Civil War, letters between a husband and wife, ancestors of Wilbur Lee. The Meyer’s are the featured speakers in a special Hosmer-Williams Lecture Series that is sponsored by Historic Elsah Foundation and the Green Tree Inn, Elsah, Illinois. The Hosmer-Williams Lecture Series is underwritten by Liberty Bank of Godfrey, Illinois. This is the story of a soldier in the 101st Illinois Infantry Regiment in the Civil War. The Regiment, organized in Jacksonville in 1862, first saw action around Holly Springs, Mississippi and later in campaigns around Nashville, Chattanooga, Atlanta, and Sherman’s “March to the Sea.” The 101st was in North Carolina when Lee surrendered at Appomattox. 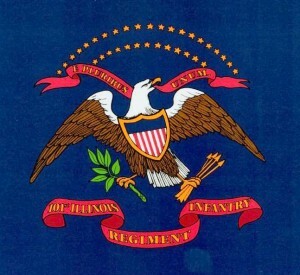 The Regiment was mustered out, paid off, and disbanded in Springfield, Illinois in June 1865. The Meyer’s live on a farm near Beardstown when they are not traveling about Illinois sharing their stories of family, the Regiment, and the war. The lecture is free and open to the public. Refreshments will be served following the lecture. Reservations are not required. Parking is available. For additional information and a digital copy of an informational flier, contact Tim Tomlinson, Historic Elsah Foundation, 618.374.1518, text a request to 618.513.7119, or email a request to trt1033@aol.com.